﻿Customise your own surf, day, kombi van, part and full camper. ​VW T4 and T5 specialists. Surfbus designs and converts any van into a versatile leisure vehicle. Whether you are into surfing, paddleboarding, wind and kite surfing, mountain biking, motor cross or just want to relax away from it all, Surfbus can design and build your dream custom van to carry you, your passengers and gear to where you need to be......out there! We started our Shoreham based business in 2008, following our dream of creating our own family day van. Massive fans of T4 and T5 VW Transporters it was the start of the dream project. The thought of exciting adventures travelling around the UK with the family, fuelled the desire to create a stylish, fun and practical vehicle. This one van became the starting point to creating the successful family business; Surfbus. With over 30 years working in the marine industry, refitting yachts and motor boats, I have specialised in wood craftsmanship. 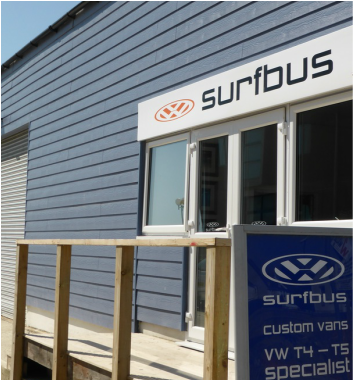 Designing bespoke furniture and interior storage, painting, electrics and exterior renovations, these skills have all been used to great success in Surfbus. Since those early days our business has grown by word of mouth. This is great testament to the excellent customer standards we uphold and to our informal approach we have to welcoming you, our valued customer, to Surfbus. We want you to enjoy your adventures as much as we enjoy creating the dream van for you. We pride ourselves on providing the best customer service. We understand that the small details matter and we ensure that we turn your vision into your dream van. Working with our customers all the way from the design process, through to regular updates on progress, to handing you the keys.